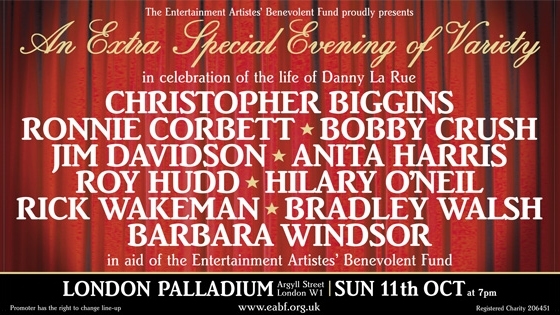 On Sunday 11th October 2009, the EABF (Entertainment Artistes’ Benevolent Fund) presented a tribute to the late Danny La Rue at the London Palladium. Danny was a former Vice President of the Fund. The show was produced by Roger Kitter and Peter Elliott. Artistes appearing in the show included Christopher Biggins, Ronnie Corbett, Jim Davidson, Anita Harris, Roy Hudd, Hilary O’Neil, Rick Wakeman, Bobby Crush & Bradley Walsh, with Dancers from Laine Theatre Arts and an Orchestra conducted by Trevor Brown.